Feeney is a minor figure whose presence is noted but who doesn’t speak in the story. He’s an Irish intelligence agent who, it is implied, orders and oversees the execution of the British prisoners. Canavan, Michael. "Guests of the Nation Characters." LitCharts. LitCharts LLC, 1 May 2018. Web. 23 Apr 2019. Canavan, Michael. 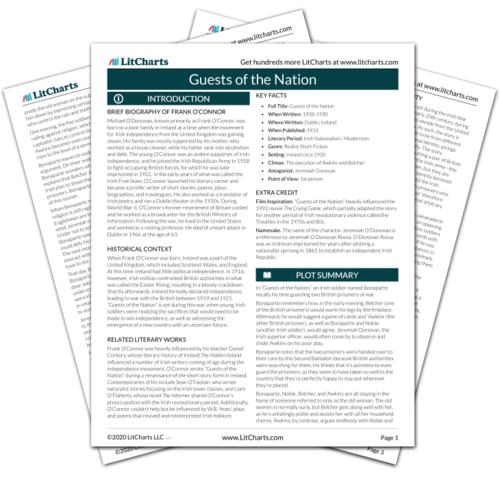 "Guests of the Nation Characters." LitCharts LLC, May 1, 2018. Retrieved April 23, 2019. https://www.litcharts.com/lit/guests-of-the-nation/characters.